When it’s time to replace your old water heater, you want to be sure that you’re getting not only the best replacement unit for your money but the best installation, too. 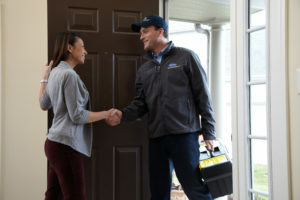 Buying a new residential water heater from Front Range HVAC is an easy process that gives you peace of mind knowing that both the equipment and the installers are top-notch with a history of proven expertise. Any time we are trusted to sell and install a high-quality residential water heater, we follow a meticulous, 5-step sales and installation process. Preparation of the work area. This is a step that many other companies overlook. Before we begin any work, we prepare the area first, making sure that all equipment is accessible while maintaining safety and cleanliness. Removal of the old water heater. If your old water heater can be recycled, we can help to arrange that for you. Or, if disposal is the best alternative, we’ll help to make sure it’s done responsibly. Installation of the new water heater. Whether you choose Carrier or another water heater manufacturer, the installation technicians at Front Range HVAC will treat your installation job with 5-star, white glove attention to detail. Testing and commissioning of newly installed unit. After your new water heater has been installed, we perform a series of tests to ensure that it is functioning according to the manufacturer’s guidelines. Follow-up post-sale to ensure ongoing performance and efficiency. Some modern water heaters may need tweaking after they’ve been installed and running for a few weeks. We stay in touch with you until you’re confident that your new water heater is fully ready for a long-life providing comfort and utility for you and your family. At Front Range HVAC, we understand how daunting and intimidating buying a new water heater can be. When you choose us as the provider of your new residential water heater, you’re making a choice that will serve you well into the future. Many of the water heaters we’ve sold and installed in Colorado have operated without a problem for more than a decade. We think that’s why our customers keep telling their friends and family about us. To inquire about purchasing a new Carrier residential water heater, or if you have questions about other water heater solutions available from Front Range HVAC, get in touch with us today by calling (303) 942-1372. Our team is standing by to help!